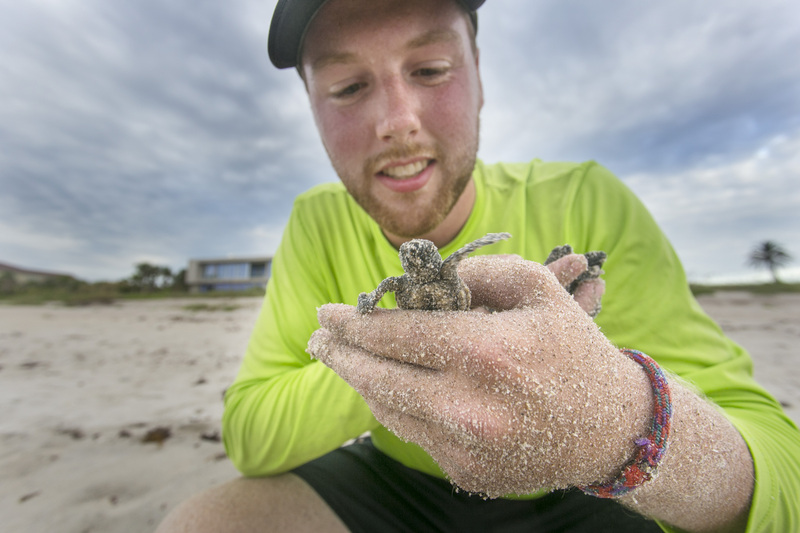 Wildlife and Conservation Biology major Grey Miller ‘20, who chose UNH for its easy access to hiking and camping in the White Mountains, talks about why he jumped at an opportunity to spend the summer collecting data on sea turtles for the Indian River County Coastal Engineering Division in Vero Beach, Florida. Miller’s days began with an early morning survey across a designated 11-mile stretch of beach, and ended in the evening with surveys to assess nighttime lights that could confuse turtles and affect nesting and hatching success. In collaboration with the nonprofit Coastal Connections, Inc. (CCI), he also narrated “turtle digs,” during which volunteers dig up turtle nests to inventory reproductive success as interested spectators look on. College Of Life Sciences and Agriculture: Looking back on your time at UNH so far, what are you most proud of and why? Grey Miller: When I look back at the time I've spent at UNH, I am most proud of my 2018 summer internship. I feel that my time at UNH properly prepared me to take on the rigors of sea turtle research. Besides discovering how hard it is to wake up at 5 a.m. most mornings, I learned how critical it is to protect sea turtles since they are a keystone species that affect not only their ocean environment, but the coastal environment as well by creating a healthier beach ecosystem. The experience also gave me an opportunity to spearhead CCI’s first ever Adopt-A-Nest program, which encourages area residents and visitors to sponsor a sea turtle nest. The goal is to raise funds while creating more public awareness about conservation and helping the community feel more connected to sea turtles. In return for sponsorship, CCI places signage on adoptees’ nests, provides certificates of adoption and information about the reproductive success of their nests. The program quickly sold out and is set-up for expansion next year. Miller: In my major the greatest motivation is loving what you do. Every day I want to go into the field and take in the beauty of our diverse ecosystems. It is truly amazing when you get an opportunity apply what you have learned in the classroom to the field. Miller: I am originally from Chicago so I never saw myself going down this path until I embarked on an Outward Bound trip in the summer of 2014 that changed my perception of the outdoors forever. Since my month-long adventure in Maine I've taken active steps to help me prepare for this major and eventually come to UNH and jump into the academic journey as a Wildlife and Conservation Biology major. Miller: After graduation I'm planning to apply to graduate school. After graduate school I'd like to enter the field and jumpstart my career and see where it takes me. work in the field and make observations. I was able to apply these skills over the summer during my internship and will continue to build on them now and into the future. Miller: Enjoy your time in the field. Not every major gets to go outside as consistently and take in the beauty of our natural world while gaining valuable skills. Miller: I love the accessibility to the White Mountains and the Atlantic Ocean. There is always a new place to explore and find adventure.